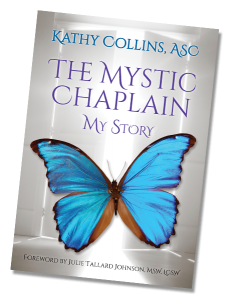 This memoir is a whirlwind journey that takes you through the throes of fighting cancer to a mystical awakening of the metaphysical world, messages, visions, self-healing and synchronized events of people put on her path to understanding our oneness. 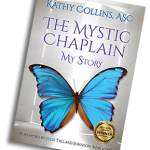 Upon entering her chaplain studies and pursuing her life’s purpose, Kathy’s chaplain supervisor could not classify her with any one particular religion, so he referred to her as a mystic who lives the spirit of the word. Her conscious awareness is used to help those transitioning at the end of life without the chains of fear. Chaplain Kathy asks us to be still and experience the unique connection of bringing heaven and earth together through the Divine Source that resides in the loving memory of our own heart.